©Bert Gildart: OK, it’s official! On May 17th Montana Public TV will air a “Night of the Grizzlies” retrospective. As many may recall, 43 years ago on August 13, 1967, two young women were fatally mauled, one at Granite Park Chalet, the other, at Trout Lake. A huge mountain range separated the two incidents as did about eight linear miles, making it impossible for the same grizzly bears to have been involved in both tragedies. However, conditions at both sites were similar in that the bears had been habituated to people by the presence of garbage. At Granite Park Chalet, managers were intentionally disposing of garbage immediately behind the rustic stone building, doing so to attract grizzly bears. Unfortunately, the route the bears followed to the chalet passed directly through the Granite Park Chalet campground, and on that horrible night, the route led directly to where a young woman was camped. 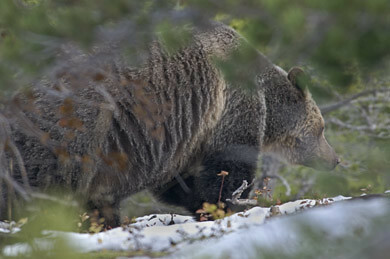 By virtue of backcountry neglect, once Glacier's grizzlies dined sumptuously on garbage. Generally, it was unintentional, but not always. At Trout Lake campers had been disposing of excess food or food they couldn’t eat, creating odors that also attracted bears. Much the same had happened at other park campgrounds, but the conditions were particular serious at this beautiful site because it also happened to be some of the park’s best bear habitat. As a young ranger in the park, I was involved with the two incidents, tangentially at Granite Park Chalet, and personally at Trout Lake. At Granite Park Chalet, I heard the call for help over the radio as I was shuttling a huge CAT over Logan Pass. It was about midnight and I was on road patrol, and the radio pack set at the chalet was apparently too small for effective transmission. From my patrol car (I was working that summer as a road patrol ranger) I relayed the message to headquarters. The next morning I was astounded when Norman Hagen, another ranger, pounded on my door and said that I must hightail it to Trout Lake, for there had apparently been another bear mauling. Today, upon encountering people, MOST bears in Glacier prefer to go another way. Gus says he will soon known the URL for an Internet “streamed” version and that he will share it when it is final. That means people all over the world can watch the program on their home computers. I’m excited as I believe the program will dispel many myths. Presumably, because the program is airing on the 100 year anniversary of Glacier National Park there will also be some retrospective on what conditions were like in 1967, and what they are like now. At the time, after finding the body of one of the young women, I had to wonder why we needed bears in Glacier, but my thoughts have changed. They’ve changed because these magnificent beasts are no longer habituated to garbage, and that means your chances of encountering a grizzly bear are really very, very small. This entry was posted on Thursday, April 29th, 2010 at 6:47 am and is filed under Glacier National Park, Montana Photography, National Lands, Natural History/Conservation, Photography. You can follow any responses to this entry through the RSS 2.0 feed. You can leave a response, or trackback from your own site. Sandi and I look forward to the reenactment and interviews. While Brad Pitt could fill your role as of today, you’d need somebody much younger and burly to come off as you during your youth….. Don’t you think? Please make sure to post the link to the video when available. I’ve seen several shows regarding “the night of the grizzlies” and I really want to see this. I’ve read your prior posts, and shared with my readers. I’ll be sure to pass this one along when the video is available. 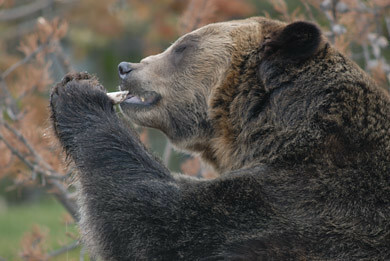 Someday I’ll have my very own photo of a grizzly. Of course, I’m figuring I’ll be tagging along with you when I get it!